I missed it by one day, but I'm finally showing you my spring home. If you have been here before, you know I change out my colors for the season. I'm able to do that because my background is all neutral. For spring I've been using jadite green and a pretty aqua turquoise. I found this striped pitcher at the thrift store. Love to fill it with cotton stems. Here is the family room. I keep the colors going because of my open floor plan. And here again is my favorite new thing-my open shelves in the kitchen which I am truly loving! I finally joined Instagram so come check me out. Just click on the camera icon on the top of the sidebar. I've been busy thrifting (not buying much) trying to control that, and getting the garden going. It's been super warm here. I hope you are getting some nicer weather so you can be outside. Happy Spring! 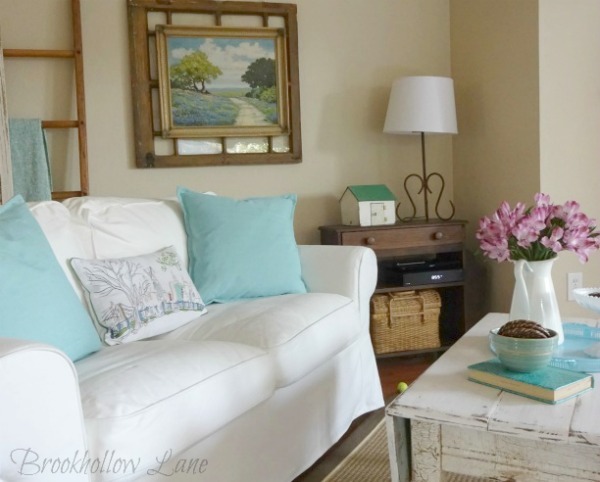 Hi Leslie, I love your home for springtime and the gorgeous green and aqua mix of color. Having the neutral background is perfect for this and I do the same. I always look forward to seeing your kitchen hutch changed for the season. Love your darling thrift find in that blue stripe pitcher. Looks great with cotton stems. So glad you are on IG now. It's so much fun seeing you there. Can you believe our heat already? Yesterday was 92 degrees. Enjoy working in the garden. Happy Spring! You are too sweet. Thank you. I love having the neutral background, don't you? And I am having fun on IG for sure. Still trying to get some plants in, but it has been so hot already. Hope you have a nice week! Your spring decor is just beautiful! I love the green and blue against the white. SO crisp and clean and perfect for spring! Have a lovely Wednesday! The way you incorporate greens and blues into your decor is so refreshing and springlike! I love your hutch...they are fun to play with. I have a neutral decor and would like to add some color for the summer...maybe a few pops of navy. Thanks for the inspiration, Leslie! I love your blue and green dishes in your hutch, perfect for spring! What is that little house looking thing on the side table with the green roof? It's really cute. Your home looks so pretty and ready for Spring, Leslie. The colors are so calming and soothing. I always love to see how you decorate your hutch and to see the signature towel that you hang on it...so cute! How wonderful that you can accessorize with whatever color you choose for the season at hand, Leslie! Your home looks ready to greet spring with your fresh green and blues. And I love how you hung your painting over an old window to make it more of a statement piece. Genius! Thanks so much for sharing your spring home tour with us and have a wonderful weekend! What a happy delight your home is! I hope you are enjoying a lovely spring and may you have a wonderful week. Hi Leslie! I've missed you and your posts! Thank you so much for popping in to see me and I hope you're doing well. Hi Leslie!! How are you doing? Thank you so much for popping in to see me and your well wishes. I'll see you when I get back to Texas.